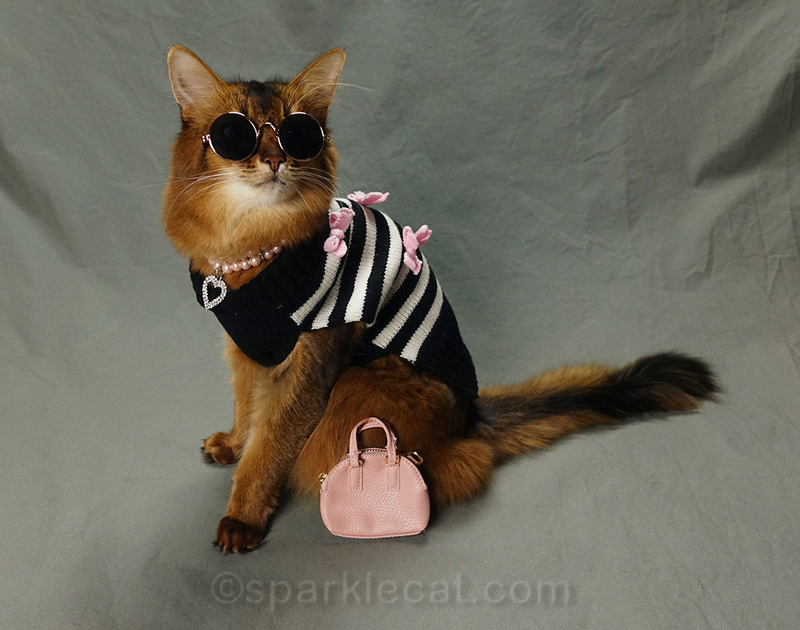 Remember my hipster kitty outfit that I wore at the cat show? If you were at the show, you could really get an idea of how it looked. But you really couldn’t get the full effect in those photos. So here I am, modeling it for you at home! I just need to put on the sunglasses. You can see the purse and the cute pink bows on the sweater much better. But there’s a problem here — the lightbox is reflected in my shades, and that doesn’t look right. Either the lighting has to look good in the eyeglass lens, or it’s better to avoid it altogether. My human decided to go with avoid. This is much better! Some people suggested I needed a cute little beret to go with my ensemble. So my human is going to keep a look out for one. The hardest part of this outfit is keeping the sunglasses on! For some reason, it’s much harder with these than my pink heart sunglasses. 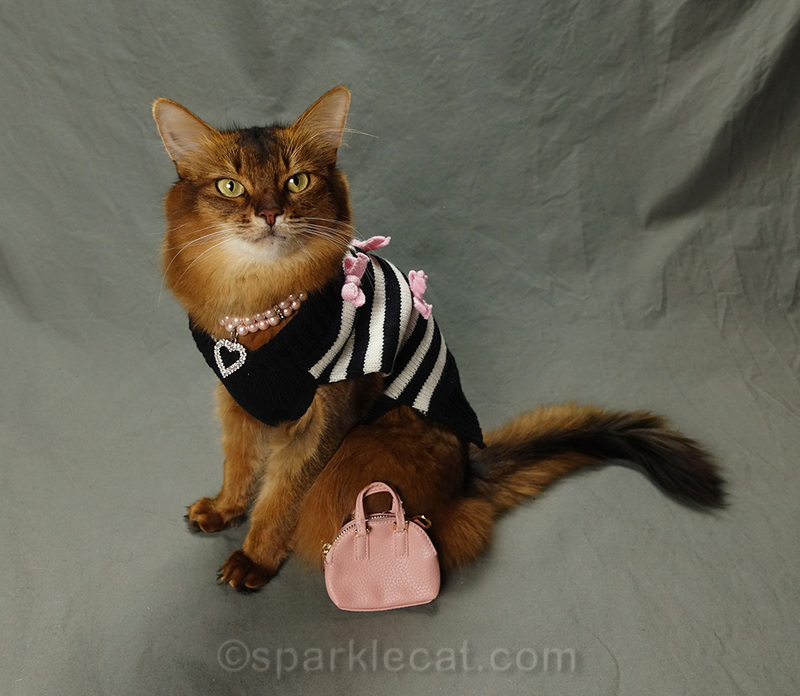 Such a cute outfit and purse is purr-fect. MK says a beret would be pure-fecto!! I think you need a pink leather biker’s cap with “S” monogram, of course, to go with your ensemble. You always wear outfits so well! Hugs. Far out little hippie chick!!! You are so-o stylin! An a little hat wuud bee xtra kewl Summer! Summer, you’re a pretty cat! I think the sunglasses are a great addition. You look right out of the society pages, Summer! You look so very stylish in those shades. super cute, Summer! we love the little purse that goes with your ensemble 🙂 but wait, there are no treats in it?!?!? Summer, you look amazing! How do you carry that purse? Or do you have your human do it for you, like a real movie star? We do like this outfit and the purse! You wear the sunglasses well too. You really fit in with all the movie stars out there! Darling outfit, Summer! you look cool, Summer. Even sunglasses! You look lovely in that outfit, and I love those glasses on you. Now Mum ants an outfit like that!!! Beautiful and beautifully accessorized ! You just have that WOW factor Summer. Looking good. look complete with the glasses too. They are sold as cat sunglasses! Oh, my stars! We have no words. No. Words. Except that you look fab. 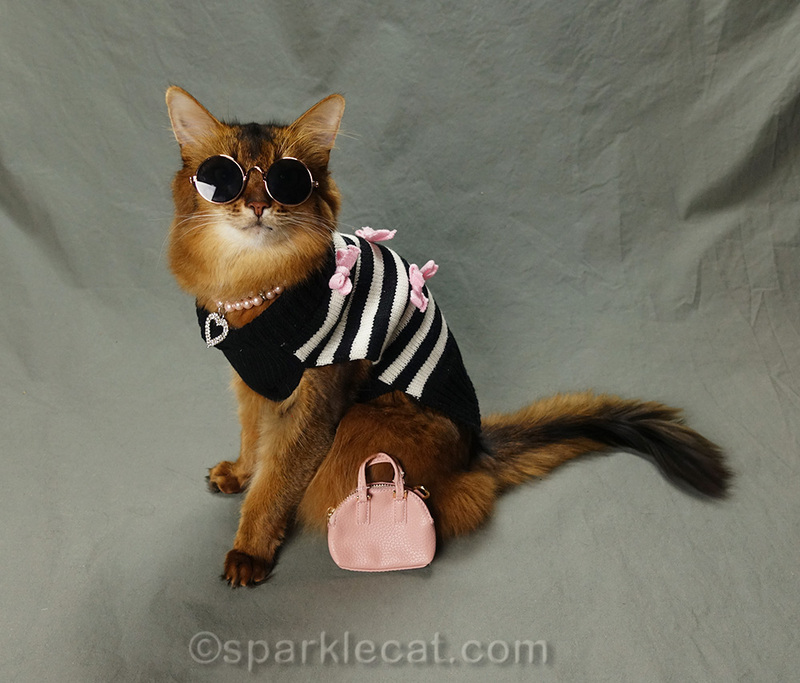 My goodness, Summer…you look spectacular in your sunglasses and little pink purse! That’s sure stunning sweet Summer and you’re rockin’ that outfit! You’re always in fashion, Summer. I typed a long er message than usual and it failed to send. Mom and I waited a good several minutes. Finally it did and nothing was here. Wanted to say that and that I expressed the thought that this outfit and the round lensed sunglasses are very attractive on you. And that beautiful pink purse needs to have something in it! Treats! And now. Not later. That purse though. So practical! You look too cool Summer!